While many of us think a lot about what we put into our bodies, going to great lengths to avoid a list of ingredients, additives and processes long enough to fill a page, there are still relatively few people who put the same level of consideration into the negative health effects of many materials used in home construction. "We unfortunately don't think about ingredients in building products as much as we think about ingredients in other things," says Michael Walton, executive director of green|spaces, a local nonprofit focused on environmental sustainability and enhancing quality of life in the community. "Even very expensive homes get filled with some of the nastiest stuff out there." Examples include formaldehyde, used in adhesives on interior doors and cabinets; Volatile Organic Compounds, found in construction adhesives and paints; and phthalates (endocrine disruptors), released from vinyl found in floors and windows. But people are starting to take notice. From older buyers looking to reduce their energy bills and more easily project fixed expenses, to young families who want a home built with healthy materials, the demand for energy-efficient, healthy homes is growing. In 2016, 33 percent more net-zero homes were built across the U.S. and Canada than the year before, according to a Net Zero Energy Coalition Report. After all, it's hard to resist the temptation of leaving electric bills behind and having them replaced by energy credits. Net-zero homes produce as much energy as they consume over the course of a year. In 2014, green|spaces launched a project to answer the question of why healthy, high-performance homes aren't standard practice in new construction. Walton says builders reported that buyers weren't asking for features like energy efficiency and healthy materials, while buyers believed those features must not be available or possible to include in a home built at their price point. The nonprofit wanted to produce a product that dispelled both of those assumptions, he says. Chris and Jill Wilson, a couple in their late 20s, purchased the first of green|spaces' resultant NextGen homes last March. "We honestly weren't looking for a 'green' house," says Wilson, who, along with McKay, had lived in apartments on the Southside and downtown and was looking to buy a home in either North Chattanooga or the Southside. They kept coming back to the NextGen home, drawn to the modern, open design as well as the location. Wilson says they'd considered putting in an offer on a similarly priced home off Forest Avenue nearby, but it would have required $50,000-$100,000 in upkeep a year. Getting a net-zero home for basically the same price — $346,000 — was too good to pass up. After nine months in the home, Wilson and McKay received their first electricity bill in January, as they'd built up credits from the home's 4.75kW solar array during warmer weather, Wilson says. The total bill for their three-bedroom, three-bath, 1,700-square-foot home was negligible. Even without solar panels installed, the monthly energy bill for one of green|spaces' NextGen homes averages around $45, says Walton, so it doesn't take much solar energy to get them to net-zero. Some states, such as California and Washington, are mandating that all homes constructed after a certain date be net-zero homes. And the growing consumer demand for energy efficiency has led to designations like Energy Star becoming a major selling point for windows, water heaters and more. Most homes in North Chattanooga are built at a cost of $160-$175 per square foot and sold for $200-$215 per square foot, says Walton. So green|spaces invited teams of architects, builders and designers to create net-zero homes using healthy materials while also fitting into the price point typical of the area. Hamilton Avenue was chosen for the homes' location, which is a few blocks from Frazier Avenue and down the street from Publix, offering walkability to necessities and attractions such as Coolidge Park along with a neighborhood setting. The teams also had to contend with the typical topography of the area. The homes are situated on a challenging slope, which is common in the area, to show builders how it can be done. The project began with a design competition, but the winning design was too expensive to build and sell at the $350,000-$400,000 price point green|spaces was striving for. "What we really wanted to demonstrate is that you can build [energy-efficient, healthy homes] at that price," Walton says. So green|spaces ended up using the competition to inform the design of the homes rather than basing the design on the winning team's entry, says Walton, who's also an architect. 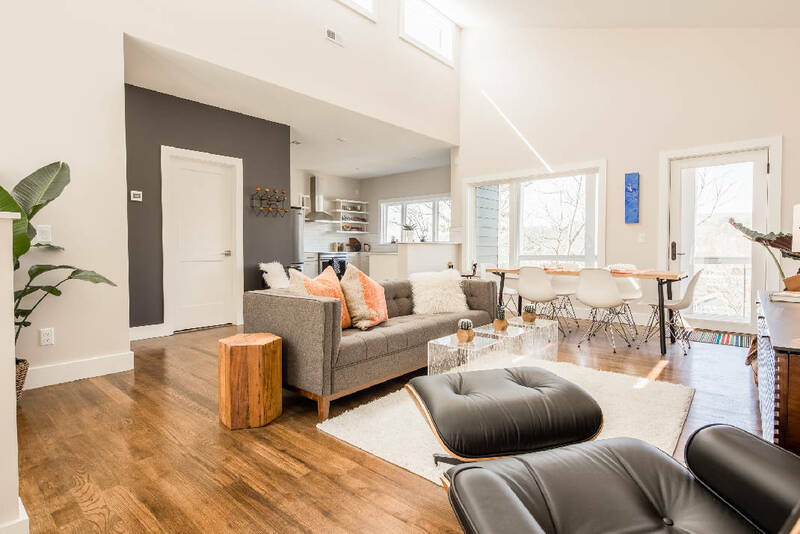 The homes were then designed in-house by green|spaces using contest participants — such as VandeMusser Design out of Asheville, North Carolina, and Chattanooga's Workshop: Architecture — as consultants. The first home was built by Collier Construction and the next three by Antidote Architecture, both local contest participants. Of the four NextGen homes, two are already occupied, one was set to be completed at the end of February and the last should be completed by the end of April. But the project doesn't end with these four homes. "We're working with other developers to help them implement the most cost-effective strategies we've learned through this process," Walton says, adding that Antidote is starting another development in Red Bank of homes meeting the same specifications. The third NextGen home completed, at 643 Hamilton Ave., is currently on the market. Like the others, the 1,900-square-foot home features an open floor plan on the main floor with views of Stringers Ridge from the kitchen, living room and back deck. One of three bedrooms is also on the main floor along with a full bath. Another bedroom, full bath, master suite with full bath and private deck, and laundry room are located downstairs. But homes don't have to be just like these to be healthy and energy-efficient. Walton says green|spaces has hosted more than 100 tours of the homes as they've progressed, with the goal of educating every part of the market, from buyers to developers to builders to people in the city's codes office, about the strategies they're using. Several couples have come to green|spaces who liked the NextGen homes but felt those particular products didn't match their needs, and the organization was able to incorporate similar strategies into their own design. Anyone building a new home can incorporate energy efficient strategies, which can be as simple as incorporating well-shaded, south-facing windows. This placement minimizes the amount of light let in when the sun travels directly overhead in the summer, but allows for more heat during the winter when the sun travels low along the western sky, Walton explains. Adding solar panels is one way to incorporate energy-efficiency into an existing home. The cost of solar panels has dropped by about half over the past decade. Most residential solar installations generate between 2 and 20 kW and cost between $15,000 and $35,000, according to the Clean Energy States Alliance. While including solar panels on new construction pays for itself almost immediately, adding solar to an older home requires a little more investment on the front end but ends up paying for itself in about 10 years, Walton says. Alternatively, homeowners can receive energy credits by purchasing panels in a community solar array, which cost $5 per panel for about $3.60 worth of energy per month, leading to a 20-year return on investment for the average energy user. Leasing a solar share in a community solar array, as Walton does, is another option, though he says it's "more of a feel-good thing" with no return on investment. People considering a solar installation of their own can find a wealth of helpful information at letsgosolar.com. All appliances are energy efficient and Energy Star-certified. The homes have heat pump hot water heaters, which move heat from one place to another using electricity rather than generating heat directly like a conventional water heater; and heat pump dryers, which recycle the same air and dehumidify it instead of exhausting old air and heating more air from the room. Toilets and faucets are WaterSense-certified, which requires them to use less water. The building envelope (outside walls, roof, foundation) is wrapped with VaproShield, a barrier membrane Walton describes as similar to GORE-TEX in that it's waterproof and airtight but still allows moisture to move through the membrane rather than trapping it in. The HVAC system, designed by local Conditionaire Company using high-efficiency, ductless, mini-split heat pumps, uses about half the energy as systems in a normal house, says Walton. Despite the NextGen homes' airtight envelope, the system's energy recovery ventilator provides fresh air to every room. The homes' hardwood floors are made with local red oak and were finished in place using a stain called AFM Safecoat. "I used it myself to stain bunk beds for my 3- and 6-year-old and couldn't smell anything three minutes later," says Walton, adding that he would have had to let a normal sealer let off gas for days. Unlike traditional windows, the casement windows in the NextGen homes open similar to a door, using a crank. This creates a seal all the way around the window. To make the homes even more airtight, the doors have multipoint latches. The homes also feature south-facing windows that are well-shaded from direct light in summer but absorb more light to help heat the home in winter. High exhaust windows pull air up through the house when active heating and cooling aren't necessary. The NextGen homes' 4.75kW rooftop solar array will generate approximately 6,410kWh each year, offsetting demand and generating an excess of energy the homeowners can sell to TVA for $641 in energy credits per year. The generation value will increase proportionally with electric rates over time, further improving the financial performance. Local landscape architect W.M. Whitaker & Associates used all native plants in the landscape design, and pervious pavers that allow stormwater to infiltrate were used on the driveway/patio. Rain barrels and a bioswale were also installed to collect stormwater and eliminate runoff. Electric car charging stations were included if homeowners wanted them. The NextGen homes were built using fewer, but bigger, studs (2-by-6 vs. the typical 2-by-4) to reduce thermal bridging, i.e. to conduct less heat outside. The depth of the wall cavities in 2-by-6 construction also allows more room for insulation. The insulation used at 643 Hamilton is ROXUL, a mineral wool fiber which is naturally flame-retardant and has a high R-value, or capacity to reduce heat flow, of R-22. For comparison, the open-cell spray foam used to insulate most homes is around R-7. All lighting is LED, including track lighting in the main living space and recessed lighting in the kitchen.